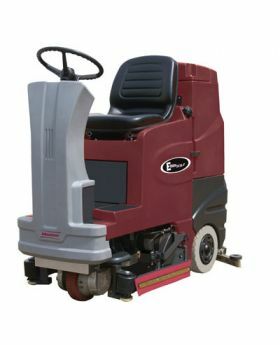 Minuteman E Ride 26 is an ultra compact and versatile rider scrubber packed with power. Maneuvering through tight spaces with ease. The E26 features a single front wheel drive that provides optimum traction and allows it to turn 360 degrees on it's own axis for exceptional maneuverability. Equipped with Aqua-Stop; a technology that is specially designed to allow a significant reduction in water and chemical usage, saving time and money.